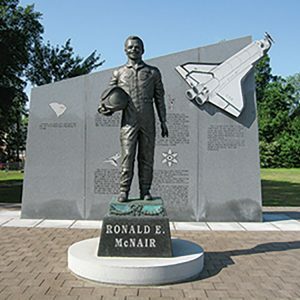 Opened in 2011, the Ronald E. McNair Life History Center is a museum that pays tribute to the life of Dr. McNair, a Lake City-born astronaut and physicist who died in the 1986 Challenger Space Shuttle explosion. Through moving photography and artifacts, the museum tells the story of Dr. McNair from his childhood to his death. A renowned physicist who was a pioneer in the field of lasers, as well as an accomplished saxophonist, Dr. McNair from an early age showed a fascination with science and math and overcame the discrimination of the 1960s South to pursue those interests. Housed in Lake City’s old public library, the museum sits next to Dr. McNair’s gravesite along with a statue and square erected in his honor.